Is There a Better Hot Wing Than Hooters’ ? When it comes to carry-out, Hooters makes us happy! The breading on the wings and the way it absorbs the sauce – the size of the wings themselves… there’s nothing better. Some people order them “naked” which means without breading and get the sauce is on the side. My Mom would do that. But why? My wife Marilyn likes the “Hot” style, with a side of “Three Mile”… she’s coming around. The breading is the magic that is Hooters’ hot wings. It’s what makes them the best in the universe. And, in my opinion, the “Three-Mile Island” sauce is their best! Yea, they have “911” – their hottest sauce, but it’s all heat and no flavor. Next down is the “Three Mile Island” sauce – very hot, but with a great flavor. Like a medium level extract-style sauce. Then there’s the “hot”, “medium” and “mild” flavors – but if you’re reading this blog, you’re not going lower than “hot” anyway. They also offer “spicy garlic”, “parmesan garlic” and “samurai”, and some local franchise’s have BBQ wings, but now we’re getting out of the “hot wing” arena. Typically hot wings come with celery and blue cheese (or ranch) dressing. I am disappointed that Hooters charges extra for celery and blue cheese (a plastic cup of a commercial product), but when we bring them home, we make our own blue cheese anyway. See recipe link below. Before you order your wings from Hooters, cut up your own celery sticks and make our easy blue cheese dressing. (You can even do this the night before.) Then when you get your order home, the sauce will be soaked into the breading, and you’ll have the best carry-out wings in the universe! Hooters’ wings are decent, but the heat level in their sauce is laughable. I’ve had the “911” sauce from many different locations, and I think it’s literally no hotter than Tabasco Sauce. And no, it’s not just the heat freak in me who’s build up a tolerance to spicy food; the sauce is truthfully very, very weak. For the big chains, my favorite is Buffalo Wild Wings. Their hottest sauce, Blazin’, actually packs a small punch. I wish there were a Buffalo Wild Wings near us. There’s one about 65 miles north, in Dover DE. Guess a road trip will be necessary! Thanks Scott! Did you guys ever end up trying Buffalo Wild Wings? I got their Blazin’ Sauce in the mail yesterday. It doesn’t list extract, but it tastes like it, it’s got that bitter note. I just feel they could have done so much better with the flavor of this one. Their mango habanero is good though. I might try their Wild sauce or something even lower on the heat scale. We did get to BWW and sample a few of their wings and sauces. I wasn’t that impressed, but let me say they were *swamped* so the service was slow. I know at the time we didn’t feel compelled to purchase any sauces to bring home. But we will make another trip to a BWW again, maybe on a slower, quieter night (in a sports bar? we’ll see!) to take some notes and write up something about our visit and the sauces. I did speak with the manager and he told us their co-packer for their bottled sauces was T.Marzetti, the same folks that make Marzetti’s, Cardini’s, and Girard’s Dressings. Meh. Guess that influenced me to *not* make a purchase at that time. There just was no flavor in the Blazin’, it made me want to brush my teeth right away to get the taste out of my mouth. I’m curious if the Wild is any better. I’m all for face melting hot wings, but they have to taste good too. If you guys end up going to BWW, please do a review on the Wild version. I am tempted to order it, but I’m afraid it will have that metallic taste that the Blazin’ has. Have you guys tried anything from Anchor Bar? I am really impressed with the flavor. I know they aren’t considered mom & pop, but don’t they only have the one restaurant in Buffalo? That seems kind of mom & pop to me. Anyway, I love their Suicidal wing sauce, but I tried their Medium the other day, since it’s the only version my grocery store carries, and it was really good! I was really surprised, since I never buy Medium. I wasn’t aware you could put Hooters and wings in the same sentence. It’s kinda of like calling a Prius a sports car. Or like a cheerleader playing tight end? Hehe… I knew you’d have to chime in on this story, John. Absolutely! Brian, they don’t even visually resemble wings. They look more like overcooked zeppoles. Zeppoles… Mmmm… I love fried dough. With chicken in it. And doused with a good hot sauce. I have to agree with Scott Roberts hooters wings are pretty timid and just doesn’t have that wing flavor and kick that I love. Also agree big chain wise Buffalo Wild Wings has some really good sauces and their blazin sauce is has a nice kick to it. I personally usually mix the blazin with the hot sauce for a good mix of flavor and heat. My wife mixes the Hooters’ 3-mile island, with their hot for the blend she likes. I will report back after I get a chance to travel to a Buffalo Wild Wings joint. If you do I would also suggest giving the mango Habanero sauce a try sure it is not standard hot wings but it has some pretty good flavor to it and has that tiny bit of heat that sits on the back or your throat. Mixing the blazin with the mango habanero is good too if you want something a little different from the normal hot wing flavor. I agree with Midpipps. BWW’s Mango Habanero absolutely HAS to be tried. It’s a sticky, glazy, wonderfully sweet, nicely hot gift from heaven. ;) I also like their Caribbean Jerk and Spicy Garlic. Thanks, Scott. All the more reason I have to make a trek to BWW in Dover, DE. And, bonus, Chip Hearn’s peppers.com is on the way there. Hooters is a monthly visit for me, but I don’t usually get their wings anymore since I started having Defcon. I did get their new chicken finger sammich last week, smothered with cheese and it wasn’t too bad. I don’t think they have much heat either. I went to BWW on my way back from WoF last year, and they weren’t too bad. I wouldn’t go out of my way for them though. Thanks, Buddah! I still think I owe it to myself to check out BWW for myself. Some of you may be too young to remember a day when Hooter’s was first on the block (in many areas) with decent hotwings. There are other places now that are widespread, but back in the day Hooter’s was the only place most people thought of when the craving for wings came on. I eat the wings from the other places when I can’t get to a Hooter’s, but I’m brand-loyal to them and probably always will be. However, I typiccally call my order in now since I’m an older family guy now that really don’t care to hang out in a Hooters any longer. Hey, thanks for pointing out a bit of history! Hooter’s began in 1983 in Clearwater Florida, almost 20 years after the Anchor Bar served the first buffalo wings. I don’t remember digging any bar’s wings until Hooters opened here. 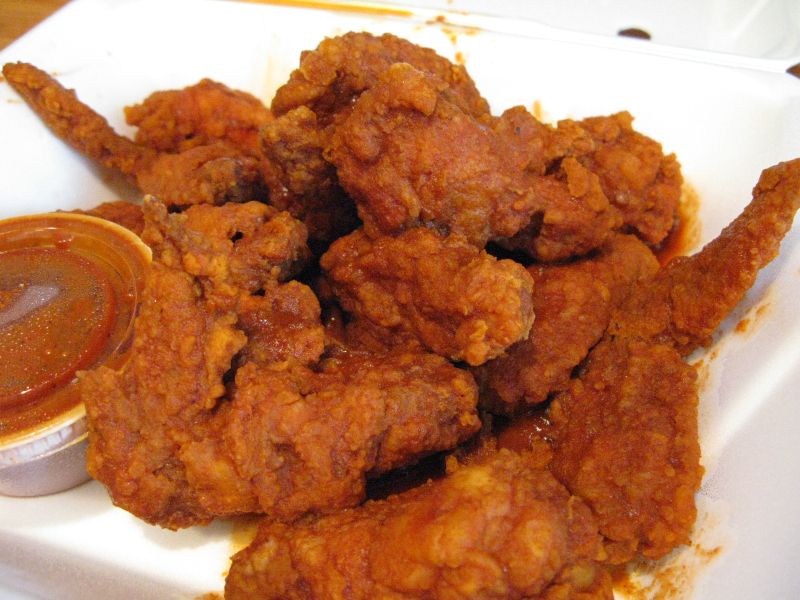 Out of date on this post I guess, but just found the site looking for a Sriracha wing recipe :); and couldn’t believe I saw Hooters listed as best wings – are you crazy!?!? I lived in Clearwater, FL when the original Hooters opened and the food and wings were good; but, I don’t go to any of them anymore. They have taken the franchised-out route and don’t deliver like they did back in the day (like local Outback, et al.). There are quite a few local places putting out a lot better wings than Hooters does – along with good, real, homemade, blue cheese sauce too! I’m still in Pinellas Co, St Pete, and they just opened a Hooters right up the street from me, but I won’t go there! Better wings just up the road both ways.. I prefer naked wings with flavorful sauce, and good blue cheese for the celery (don’t cut the heat on the wings w/ the BC). Hooters doesn’t cut it anymore. @Edie – wings are *never* out of date! Thanks for commenting. I hope you found our Sriracha Garlic Wings in your search. We do have some awesome wings coming from our local joints here in Ocean City, MD, a resort town that is chock-a-block with bars, and therefore, wings. You like naked wings with a flavorful sauce? Again, I agree… they’re the classic prep. But I still admit, I love the way Hooters does the breading, and how the sauce soaks into that. Next to a great, crispy, naked wing in good sauce, I think the Hooters product is still awesome. 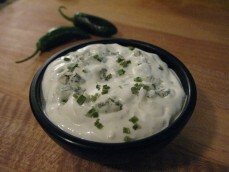 Oh, and be sure to check out wife Marilyn’s awesome Homemade Blue Cheese Dip – it’s simple and spot on for wings. The hottest wings I ever had were in Tooele Utah in a bar called TRACKS. Just ask for the INCINERATOR SAUCE………… I could smell the chilli when the plate came out of the kitchen and that was 10 yards away. I’m European and dont have a long history with buffalo wings….started for me on a special forces base in IRAQ when i was a contractor………. Thank you America and God Bless You. Hey BOB, I’ll have to try the garlic wings naked. They sound awesome. I know what you mean by smelling the sauce as it comes out of the kitchen on the really hot stuff. That is a rush all unto itself! I have seen many a cheerleader with a tight end! I ordered the Hooters Three Mile Island wing sauce based on this review. I hope it’s nice and thick. One interesting thing is, I didn’t see butter in the ingredients for this one, but the Hot version has butter…It’s funny that you guys are saying the Buffalo Wild Wings Blazin’ sauce isn’t too hot, because I was watching a video on youtube and this guy was crying after only eating a few Blazin’ wings. If I can get a good deal on shipping I might order either the Blazin’ sauce or the Wild sauce. Three Mile is my favorite. Hot without being ridiculous. Thanks for this review, because of it I bought the Hooter’s 3 Mile Island wing sauce and I loved it! This sauce and Sean’s Booyah Too Hot wing sauce both ended up being exactly what I was looking for, like the suicide wings they serve at bars and restaurants, really red and that gritty thickness from pepper powders. I wasn’t sure exactly what I was looking for until I saw and tasted these two sauces. It’s hard to know because restaurants never tell you the ingredients. I’m so happy to have found these two sauces. Of course now I have to go and find Sean’s Booyah Too Hot sauce. Red, gritty, thick… sounds awesome! He sells on Ebay and fooducopia. Yeah, if you know of any other gritty thick red wing sauces, please review them. I had to try about 50 wing sauces before I found what I was looking for! Hey Brian. It sounds like you’re going to want to try the CREEPER which is a complex wing sauce (med hot up front with a slowly creeping and building heat in the back end… & 2010 & 2011 Gold Scovie winner) you’ll also want to try the HAMMER (2011 silver scovie winner and 2nd place at Natl wing festival over the Anchor Bar) it’s our hottest sauce and it’s also the most flavor the laws of chemistry and physics will allow to be crammed into a scrawney little chicken wing. Enjoy. Sean. Sean, what’s the Hammer? I don’t see it listed on your site. If there’s a hotter wing sauce, then I’ll have to try it, as long as it doesn’t have extract in it. Is Hammer the Real Hot Version, because on Fooducopia they call the Real Hot version The Creeper, not The Hammer. If there’s a hotter version than Real Hot, I’d love to try it. Hi JenB, the HAMMER is one of the new sauces we unveiled to the public a few months back at the National Buffalo Wing Festival and the folks up there loved it. There’s no extract. The booYah! is all about big flavor & matching heat. This is the biggest wing flavor on the planet so matching that flavor puts its heat in the extra hot arena. Until we get the links fixed, just order Creeper from fooducopia.com and ask the seller to send you the HAMMER instead. Sean, I gotta have the “HAMMER” to see for myself. Shoot me a private email. I can’t wait to try this, so excited! I’m a definite Hooters wings fan, but not for the heat. I agree that the heat level is laughable, but the sauce is unique and I love the flavor. I carry a small container of Blair’s “Death Rain Nitro” around for an extra blast of heat on milder wings and foods. I also have 2 Buffalo Wild Wings within 5 miles of my place, so I’m there a lot. Excellent wing sauces as well. I’ll bounce between Wild and Blazin’, depending on the mood. Blazin’ will definitely grab you after about 5 or 6 wings. 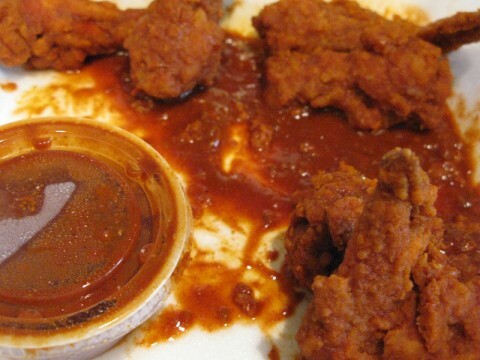 We have a local joint called Smitty McGees that serves a wing doused with Dave’s Insanity Sauce that really hurts. Brian loves them, but they are way too hot for me. As a matter of fact you can just buy 1 wing to try it. Pretty cool. Have you tried the wing chain of “Wings Etc”? They have a sauce they call “The Wall”. If you can eat 15 of their hottest wall sauce wings, you get your polaroid on the wall. You can’t drink anything, though. I’ve tried a few and they are DANG hot. I can’t eat anything without drinking, though. Wings Etc is a midwest chain only in Indiana, Illinois and Michigan. I’m afraid we’ve not had the pleasure. Funny you mention the Wall, Smitty’s does the same thing if you eat 10 Insanity wings. I have to echo the sentiments for Buffalo Wild Wings. While almost nothing beats Hooters wings (and they have Guinness on tap), the Thai Curry flavor Buffalo Wild Wings sauce and wings is a killer. And they have Guinness on tap, which is the perfect beverage for spicy food. Hey Tom, that Thai Curry flavor on BWW really does sound like a killer and as a new fan of Guinness I can see how they would work. Check out our post on using Captain Thoms Thai Monkey on wings… it freakin’ rocks!!! The 911 wings are the best to me. Decently hot but not painful and the flavor is second to none. I have my own recipe for buffalo sauce that is extremely hot and good tasting. Best to let the sauce sit in fridge for a hour so it thickens. Thats the basic recipe for the sauce, if you have other spices preferences, you can add them to but i found that this is a good tasting and hot recipe. Nice looking recipe there Corey. You start with a basic cayenne pepper sauce (Texas Pete), then add some spices for extra flavors. And you give good tips for setting the sauce and suggestions for other spices. Excellent! Thank you. nice review of a great wing. they have recently shut down 3 of the locations in and around seattle. I have to drive to tacoma now for these wings, I’ve always loved the scenery, hated the atmosphere, but kept coming back for more and more wings, i just can’t get enough of the breaded hot, or breaded 3 mile island. I think that we can all see there is a massive difference in opinions that points to individual pallets. Before reading this I would have SWORN That Hooters Tree Mile Island were the best wings on the planet. (hot enough, AWESOME Flavor) OOOOOOh… The Flavor…….. and I do not care for the 911’s at all. To me, barely any flavor, and not especially hot. Also, I Love the atmosphere at most of the Hooters I go to. Festive, Fun and easy on the eyes. My kids love it too…including the wings. I cook them at home many times per year. Now, Fortunately…I have got to try the Booyah! I have to agree with you, Shaun. Three Mile are my favs, and 911 has no flavor. Have you tried Defcon Sauces? Their No. 2 is a delicious, all around heat and flavor wing sauce. We reviewed Defcon here. My fave wings are from WingStop! But I love the breaded wings from Hooters! I have eaten Hot Wings every where and I still think Hooters is The Best by Far. I would stiig go their to get wings even if the Girls wore long sleeve shirts and jeans, just saying. I have to agree, Jerry. I don’t go for the girls, I go for the wings. Although, they are so darn cute! I just found out that some Hooters locations serve fried pickles, but sadly, not our local one. Did Hooters change their three mile island recipe? Why do you ask, Rod? Can you elaborate? A Texas Hooters rep told me that they did change the sauce supplier. He was not aware that the sauce had changed – but after calling around to different restaurants, discovered that many customers have been complaining. He said he would report it to corporate but could not promise that things would go back to the way they were. Go to Hooters.com and complain via the Hooters Hotline. Saying Hooters has the best wings is like saying Tostinos makes the best pizza in th universe.